Empire Today - Thought everything was good....until my order was randomly cancelled! Thank you for making us aware of your experience. We regret the lack of communication that you received and wish to learn more. We will be following up with you soon. I placed an ordered with an Empire Today associate -David- for skylight blinds in my living room. The sales rep was very helpful and even said he had skylights similar to mine. I told him I wasn't in a big hurry but as time went on with no contact, I became concerned. Finally, Trent- the one taking measurements- came to the house twice. I waited again for installation information. Then a few days ago, I received a refund check for my deposit. There was no explanation as to why I was receiving a refund, just the check. After going through three phone associates to find out what was going on, one finally told me that the sales rep - David - had cancelled the order due to the blinds not fitting minimum width requirements. I found that out only after having to research the information. There was no call explaining why or that the order would be cancelled. I've been waiting for weeks for installation only to find out that they never intended to follow through. I am totally disgusted with Empire Today!! 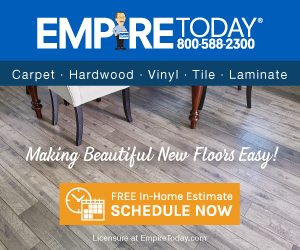 Product or Service Mentioned: Empire Today Sales Representative. Review #877102 is a subjective opinion of User877102.